Four-time World Superbike champion Jonathan Rea celebrates with his wife Tatia and children, Jake and Tyler on the podium at Magny-Cours in France. Northern Ireland’s Jonathan Rea has won the World Superbike Championship for a record fourth successive year at Magny-Cours in France. The factory Kawasaki rider claimed the title on Saturday after taking a dominant victory in race one – his seventh win in a row. Jonathan Rea has now equalled Carl Fogarty's record of four World Superbike titles. Rea, who celebrated his third world championship success at the French circuit in 2017, has now equalled Carl Fogarty’s all-time record of four titles. He said: “I’m a kid with a dream from Northern Ireland and I never stopped believing in myself and finally I got here. I had ups and downs along the way and it’s an incredible journey. Rea quickly overhauled team-mate Tom Sykes with a superb overtake at the beginning of lap two and soon opened a cushion of one second. Rea controlled the race from the front and victory never appeared in doubt as he powered to his 67th career victory. 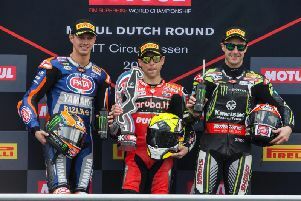 Kawasaki rider Jonathan Rea won Saturday's opening race at Magny-Cours in France by three seconds from team-mate Tom Sykes to secure a fourth successive World Superbike crown. The 31-year-old has become the only rider in history to win the title in four consecutive years. He set a then record of three successive championship victories a year ago, also achieving the feat at Magny-Cours. After qualifying in second place on the front row, Rea needed to increase his advantage by nine points over Welshman Chaz Davies in race one to put the outcome beyond doubt. He led the Ducati rider by 116 points going into Saturday’s race. Davies finished in fifth position, giving Rea an unassailable lead of 130 points with five races of the 2018 season still to go. Toomebridge man Eugene Laverty finished ninth on the Milwaukee Aprilia. Race two will take place on Sunday at 14:15 BST. The final two championship rounds will be held in Argentina (October 12-14) and Qatar (October 25-27).